Group Inerane is the now sound of the Tuareg Guitar Revolution sweeping across the Sahara Desert and inspired by the rebel musicians that started this music as a political weapon used to communicate from the Libyan Refugee camps in the 1980s and 1990s. Spearheaded by the enigmatic guitar hero Bibi Ahmed, Group Inerane has been together for several years and carries the rich tradition of Tamachek guitar songs for another generation. These ten tracks are a combination of amplified roots rock, blues, and folk in the local Tuareg styles at times entering into full-on electric guitar psychedelia. This music is performed with two electric guitars, a drum kit and a chorus of vocalists. The recordings were captured live in the city of Agadez in the Republic of Niger. 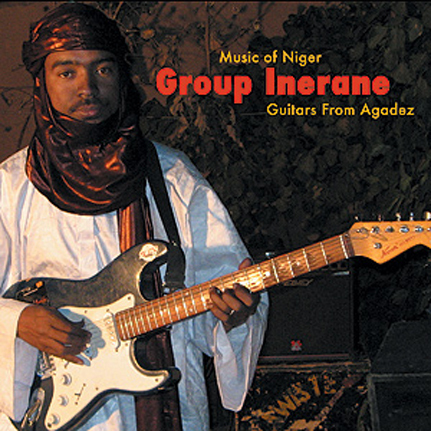 Group Inerane was also featured in the Sublime Frequencies DVD “Niger: Magic and Ecstasy in the Sahel”. Recorded by Hisham Mayet, this is the second Sublime Frequencies Vinyl Release. LP: 180 gram vinyl, full-color gatefold jacket, and limited one-time pressing of 1000 copies.